Social Media is really all about this: integrating life and technology. 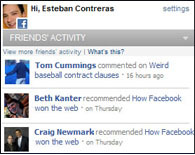 Facebook is the most widely used, widely known, and perhaps widely trusted social network in the world. As someone who got on Facebook when it first launched for universities (I was part of the SMU network before most people knew what Facebook was), I've seen Zuckerberg & Co. grow and change through the years, and one thing is for sure: Facebook has a bold and ambitious vision to become the web's social platform. I vividly remember having conversations in which people made fun of Facebook back when MySpace was "the social network." I also remember making fun of Facebook myself... only to jump in a few days later and realize that social media was what I wanted to do with my life. I figured that the social web is full of visionaries and I'd rather spend my time learning from them and becoming a bit more like them (creative risk-takers with ideas that could change the world), than simply doing the whole get-a-job-to-buy-the-groceries thing. The social web was is fascinating and it's evolving at a pace that is astounding. I wouldn't be surprised if Facebook eventually actually try to connect us to everything (like I jokingly predicted a year ago). Anyways, if I'm right in saying that social media is about the integration of life and technology, then Facebook is really unto something. As the Social Media Manager for Samsung Electronics, I worried a bit when the rumors about the terminology changes from "Become a Fan" to "Like" started to emerge. I wondered about what Facebook was thinking about and whether this would actually be good for users (because if it's not good for users, it's not good for anyone in the long-term). I like to think that most of the people who decided to join our Facebook Fan Page (sorry, but I will probably call it a " Fan Page" for a while) are real fans, so saying good-bye to that word seemed confusing at best. The word "Fan" had seemed perfect for the longest time because it was like making an emotional decision: "Yes, I am a fan!" I also figured there was something greater going on, something more "visionary" than simply changing the word with which people decide to associate themselves to a brand or a band or a book or a personality on Facebook. After hearing the announcements from Facebook's f8 Conference, and seeing the new "Like" button appear on sites like Levi's Store and NHL (as well as the interesting "Recommend" button on CNN, and the newly socialized version of Pandora), I got excited. Very excited. Maybe a bit too excited for my beautiful wife (and the average person) to understand. I won't get into the details about the new Graph API and Social Plugins, but I highly recommend RWW's "Definitive Guide for Publishers," Shiv Singh's "Internet's Glue" argument, Dave Winer's not-so-optimistic thoughts, Dare Obasanjo's "Web Dev Perspective," and Jeremiah Owyang's "First Take Analysis." Make sure you also check out Scobleizer's "Facebook Ambition" post. The fact is that I like the social web and I am fascinated by apps/services/sites like Twitter, Foursquare, Plancast, Yelp, Digg, Stitcher, DailyBooth, Cinch, and 23andMe. ChatRoulette frightens and intrigues me, but the idea makes sense in the world we live in, and I'm guessing it makes more sense to the next generations than my own. I don't actually use most of the vast array of "integrations of life and technology," but I think they give us a better glimpse about each other's lives and about human interaction as a whole. While most people don't get excited about the concept of the internets, and probably don't think about it much, many of them (getting close to 500 million) are on Facebook. And they're on Facebook a lot. My wife, parents, grandparents, pre-teen cousins, friends from High School I never thought I'd see again, and pretty much anyone with an internet connection that I know of.. is on Facebook. It's a bit surreal when you think about it. People are on Facebook because it's easy to get immersed. It's easy to connect. It's easy to reveal your identity, and to be yourself with your friends. The complexity of Facebook disappears when you see your friends' thoughts, pictures, videos, and dare I say it, pokes. The idea of extending the world's best social network, into any web site, in order to bring a huge part of the social web into it, is simply brilliant. It was a really good move by Facebook. Of course, there are a few scary parts in this, including privacy concerns and the potential for evil (with great power comes the ability take advantage of that power). More than anything, Facebook Connect, the Graph API, and the world-wide-web "Like" button continue to integrate life and technology in a real-time, creative, and even somewhat perplexing way that adds social context to the web. It's hard to predict exactly where this is all going. But, if people like it, use it, learn, and innovate from it, this could be a wild and fun ride that further connects us, and hopefully takes us offline a bit to meet for lunch to talk about how much we like Jarome Iginla, and how excited about the 2010 World Cup we have been for the last 4 years.